Famous Flamenco dancer and singer. Kind of Klimt style. Thanks I lot, I m so happy you like it! very much G Klimt! Bravo!! not enough hair follicles though!! thanks! i have just been in your gallery, i really love your portraits! you are great getting the right likeness. so i appreciate your comment very much! you're very welcome Alicia! and thanks for the visit! my pleasure! and thanks again for your kind comment! yes, olé and olé! pity there is not an specific smiley for torero/flamenco/thingies! lots of kisses and thanks again, my friend! I'm so glad to hear that I inspire you. You are very welcome my dear Alicia. thanks a lot! you are very kind! there are so many talented French artists on this site like yourself! passe une bonne soiree! de nada! muchos besos and see you around! thanks a lot again!! have a nice evening and keep up your excellent work! Thanks!! that is a very nice comment, you are very kind! nice profile picture by the way! thanks so much, you are very kind!! thanks! 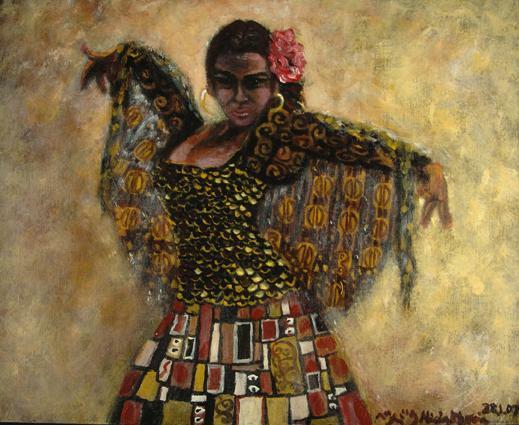 it is a slightly different theme from my other portraits, but I just love the passion of Flamenco! it almost speaks by itself! i m happy you like also this one! do you like Flamenco dancing?